Every year on 10 March, descendants of C.Y. O’Connor, along with friends and sundry stragglers like me, gather at the beach named after him to honour the memory of Western Australia’s Engineer-in-Chief, whose visionary schemes helped to transform the colony. On this day in 1902, The Chief—overworked and exhausted, harassed and reviled by the press, trapped in a volatile political environment—rode his horse along this beach one last time. But today’s early-morning gathering is no sombre affair. There are conversations and stories. Laughter. Lolloping dogs. Children and irreverent seagulls. Buckets of flower petals to be strewn on the waves and carried out by swimmers to the bronze memorial statue, by sculptor Tony Jones, a hundred metres offshore. I have found inspiration for several of my short fiction pieces in the lives of artists and their work. Kathleen (Kate) O’Connor is one who continues to fascinate me, not only because of the beautiful paintings and decorative arts she produced in the first half of the twentieth century, but because of what I have read of her spirit and the life this independent, passionate, forward-thinking female artist from a conservative colonial outpost forged for herself among the impressionists of Paris. Customs officials at Fremantle declared that Kathleen O’Connor’s paintings, her life’s work, were dutiable goods. She harangued and argued. She appealed. She called on family connections, played every card in her hand. But Customs, immune to threat or persuasion, levied the sum of thirty shillings per painting, to be paid before they would release them. Thirty pieces of silver. And so the story goes that Kathleen O’Connor, spent with stamping her Parisian feet, stood on the wharf at Fremantle while her crates were unpacked and hundreds of canvases were lifted out, one by one, deciding which of them she could afford to keep. And that, in a fit of pique, she tossed the rest over the side of the wharf, one by one. And that Paris bled into the Indian Ocean. Fremantle-based artist Jo Darvall has also been fascinated by O’Connor’s work since moving to Western Australia from Melbourne, and has been keen to celebrate O’Connor’s importance in Western Australia’s—and Australia’s—art history. Entirely independently, Jo became intrigued with the same story about O’Connor’s return to Perth and conceived of an exhibition reimagining those lost artworks. After a few coincidences that resulted in her reading my story, Jo has named her exhibition ‘Paris bled into the Indian Ocean’. It will run from 23 October to 21 November 2015 at the Merenda Contemporary Gallery, 84 High Street, Fremantle. 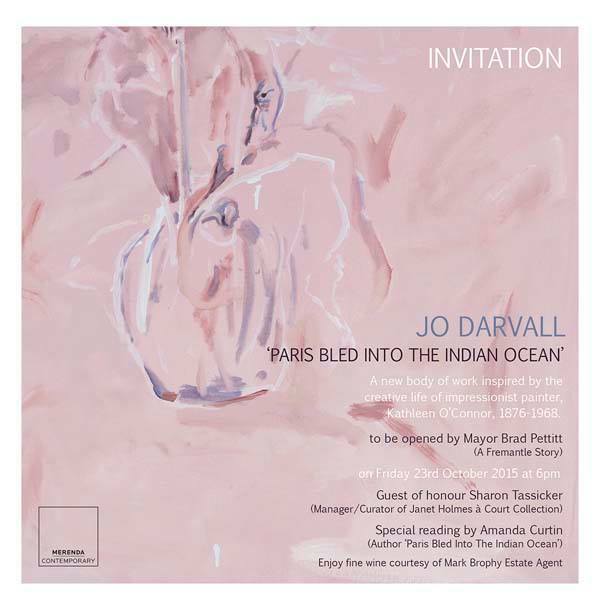 The exhibition launch is on Friday 23 October, and I’m hoping that it will be a great success for Jo. Please come along—the paintings are hauntingly beautiful and you have to view them in person to fully appreciate their stunning textural qualities. I will be doing a brief reading from the story, and I’m thrilled and honoured to be part of the celebration. As an extension of the exhibition, Jo will be presenting an additional event on 31 October, 2pm–4.30pm: a panel discussion entitled ‘Kathleen O’Connor’s Fremantle’, City of Fremantle Library, followed by a cultural walking tour, concluding with refreshments at Merenda Contemporary. The event is free but bookings are essential.